Lamentable Condition of Affairs Brought to Light by Fire Saturday Night. Because There is no Pressure to Aid Firemen in Fighting Flames. Saturday Night When Residence S.W. Corey Totally Destroyed. With the thermometer registering twenty-three degrees below zero and with practically no water pressure, Fort Dodge was visited by a fire at midnight Saturday that in many respects was of a nature unprecedented in the history of the city. The total destruction of the home of C.W. Cory at 209 Twelfth street south is credited to a combination of circumstances, which is claimed by the persons upon whose shoulders rests the property against the ravages of fire to have been impossible to forsee or prevent. The Corey residence was totally destroyed. The house was reduced to a heap of charred timbers and fallen walls covered with several inches of ice entailing a loss of nearly $5,000 ($119,747 today) not a cent of which is covered by insurance. How the fire found its origin is unknown. The fire department was summoned to the scene a few minutes before 9 o’clock in the evening. At taht time fire was discovered in a small pantry room on the northeast corner of the house in a wing with adjoins the main body of the structure. The flames were soon extinguished, or apparently so, and the firemen remained at the house for nearly two hours to assure themselves that the fire was out. At 12:10 a.m. the department was again on the scene, having been called by a second alarm in a half hour after their departure. This time the blaze was on the opposite side of the house, diagonally from the first fire. There was not water pressure and the firemen were unable to even check the flames. The fire burned itself out several hours later, leaving a mass of smoking embers where was a short time before was a well built residence. The unusual nature of the fire is to be found in several facts which cannot be disputed. In the first place there was no water pressure and in the second while not intentionally, the firemen were apparently unfortunate, failing to extinguish the fire on their first visit to the house. The third circumstance is a fortunate one. The night altho bitterly cold was without wind, and in this way lessened the danger of a more serious conflagration. With conditions prevailing as Saturday night more than one-fourth the city was without fire protection. Had there been a wind sufficient to carry the burning embers to the nearby houses the seriousness of what might have happened cannot be estimated. All consumers of city water south of Central avenue and east of Twelfth street are supplied by a single six inch main running east on First avenue south. This main supplies all the consumers in that part of the city together with the Great Western railroad company and seven flush tanks. The first mishap incident to the fire Saturday night was when the firemen attempted to connect the hose with a water hydrant on the corner of Thirteenth street and Third avenue south. In attempting to turn on the water they broke off the stem to which is attached the crank. In this way, rendering the hydrant useless. As a last resort Superintendent Pray attempted to close the valves at hte corner of First avenue south and Thirteenth street and at the corner of First avenue south and Seventeenth street. Had he been able to do this he could have shut off the water supply from the entire southeast part of the the (sic) city and concentrated the entire force on the fire. The steel covers of the manholes, however, were securely frozen in the ground and defied all efforts to be opened. Under these conditions of affairs there was nothing to do but let the fire burn itself out. Of the several lines of hose carrying water to the fire one had sufficient pressure to throw the water thirty feet, but even then it was lacking in power to break even a thin pane of glass. Under favorable conditions the proximity of the water tower to the scene of the fire would have been beneficial than otherwise. “The only reason I can see for fire breaking out a second time is that there must have been some fire there after we left,” says Chief J.V. Lowry. The first alarm was sent in shortly before 9 o’clock in the evening. The house is occupied by C.W. Corey and family and Mr. and Mrs. Louis O’Day, the latter living in five rooms on the second floor in front of the house. Just how the fire started is unknown. There was no one on the first floor at the time and so far as can be learned no lamp was lighted and the nearest stove was ten feet away and in another room. The building consisted of the main structure and a wing, the former facing west on Twelfth street and the latter facing east. The The (sic) fire was first discovered by Mr. O’Day. He had scented smoke and going down stairs went into the kitchen on the southwest corner of the wing. Finding no fire there he opened the door leading into the pantry and was driven back by the flames. At the arrival of the fire department no difficulty was experienced in extinguishing the flames after which the firemen went thru the house in an endeavor to locate if possible sparks or embers that might cause the fire to break out anew. Failing to find anything of this nature they returned to their quarters only to be recalled in a half hour. Not a Cent of Insurance. The first fire did but comparatively little damage and only that by smoke and water. Most of the furnishings were removed from the house at this time. The loss in household goods sustained by Mr. Corey is estimated to be between $200 ($4,790) and $300 ($7,185), and to Mr. and Mrs. O’Day, who occupied the upstairs room about $100 ($2,395). Mr. Corey estimated the loss on the house to be over $4,000 ($95,798). Mr. Corey suffered the loss of a grist mill by fire some time ago. As in this case, he carried no insurance. Mr. O’Day said yesterday that it was his intention to take out insurance January 1, but unfortunately he delayed doing so a lay (sic) too long. Responding to the second alarm, the firemen found the flames to have broken out on the south side of the house in the kitchen. It is thought that fire, which the firemen failed to locate, burned between the walls and finding its way to the opposite side of the building was fanned by a draught until it had gained sufficient headway to burst through the roof. After the firemen left at 11:30 a policeman was left to watch for a second fire. When he discovered the blaze he had to go several blocks before turning in the alarm. By the time the department was on the ground a second time, the fire was burning fiercely in the kitchen and through the roof. Water was turned on as soon as possible, but only a pitiful little stream issued from the nozzle. Ladders were run to the roof ot he wing, and upon a porch on the south side of the house, where the fireman vainly attempted to throw enough water on the blaze to prevent its eating its way toward the front of the house. The flames however were so fierce and the water supply so inadequate that the firemen were driven from their position and forced to the ground and the front of the house. All efforts, however, were unavailing and the men, covered from head to foot with ice, found themselves able only to throw water on the nearby houses. An attempt was made to throw water upon the roof of the Silas Corey house to the porch, but the pressure was too weak. Good fortune along prevented the fire from communicating to the gable of the house, which was only a short distance from where flames were the hottest. Brave Cold to See Fire. Several hundred people watched the fire in the early hours of the morning, and although the thermometer was 20 degrees below ezro (sic), they braved the elements. The fire could be seen many blocks away. With scarcely a trace of wind, a column of smoke fifty feet in diameter arose from the burning buidling, and after emerging from the shadows of the trees into the clear moonlight, it ascended many feet intot he air as a might white pillar. The crowd which gathered at the fire was not lacking in criticism, and had the usual large amount of advice to give to the firemen as to what they should and what they should not do. The unconcealed comments of some persons in the crowd caused several of the firemen to lose their tempers, and on one or two occasions they treated the crowd to a shower bath. Several cases of frozen feet and frost-bitten ears are reported as a result of witnessing the fire. Thermometer Registers 23 Below Saturday Night. Eight Degrees Colder Than at Any Time Previous This Winter – Warmer Sunday. Saturday night was the coldest of the winter. The government thermometer at Tobin college Sunday mornign showed that the lowest point registered during the night was 23 degrees below zero. The maximum temperature for the same twenty-four hours was 8 degrees above. The lowest temperature for the twenty-four hours ending at 7 o’clock this morning was two degrees above, while the thermometer showed the maximum temperature to be 8 degrees above. A comparison of the figures shows that during the twenty-four hours ending at 7 a.m. today, the thermometer varied only 6 degrees while during the same period of the preceding day there was a deviation of 25 degrees. Up to Saturday night the coldest weather of the winter was registered December 13, when the thermometer shows 15 below. The third coldest was December 26, with 11 below. This photo shows a train with passenger cars. Fast Passenger Train From Chicago Ran Into a Freight Train. Freight Train was Pulling into a Siding to Clear Main Line. Passenger Train Had Double-Header – First Locomotive Reduced to Scrap Iron – Fireman Cutting Jumped and Had Neck Broken. Fireman Walter E. Cutting, of Waterloo. Neck broken. Engineer O.M. Brown, of Waterloo. Cuts and bruises, not serious. Engineer Ed Stark, of Waterloo. Back injured, cut and bruised. Will live. fireman W. Wood, of Waterloo. Face badly cut. Not serious. West switch at Duncombe. About 800 feet from depot. Limited passenger train No. 1 west bound with double header. In charge conductor McCarthy of this city, and Engineers Brown and Stark, of Waterloo. East bound freight extra, in charge of Conductor McNamara and Engineer H.A. Smith, both of Waterloo. Engien No. 1005, large passenger locomotive, stripped of all parts. Will have to be entirely rebuilt. Five freight cars entirely destroyed. Small section of track torn up. No. 1 delayed over six hours. No. 6 delayed about two hours. All freights held until wreck is picked up. The second serious accident on this division of the Illinois Central occurred at 4:00 o’clock this morning, when the crack limited train No. 1, west bound, struck an east-bound freight extra as the latter train was being pulled onto a siding at Dunccombe. Fireman Walter Cutting, of Waterloo, lost his life in the wreck, while Engineer O.M. Brown, Engineer Ed. Stark and Fireman W. Wood all of Waterloo received more or less serious injuries. The huge one hundred ton locomotive is dismantled, its parts being thrown for a hundred feet from the scene of the crash, while several fregiht cars were ground into small pieces, which would not make a decent sized piece of firewood. The cause of the fatal accident is not yet determined. The crews of the two trains tell somewhat different stories, and as yet the officials seem to believe that the cause was improper flagging. Every employe (sic) concerned in the wreck has been in the service for years, and an examination of each man’s record shows it to be almost faultless. A Messenger representative boarded the first trrain that left Fort Dodge, after the accident became known, and arrived at the scene, before the work of picking up the wreck had commenced. The injured men and the deceased firemen had already been taken to Fort Dodge, but the scene was yet decidedly gruesome. A curious throng numbering as high as five hundred people gathered around the scene of the accident. Time and time again the crowd had to be shoved back in order to give the men space to work. 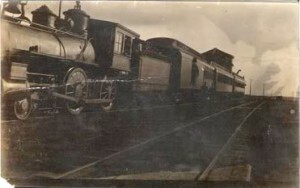 The first relief train pulled out of the Fort Dodge station about 6 .m., and had on board the company physician with a corps of assistants, and also the company officials. Within twenty minutes more a wrecking train with crew followed this train out. The first train was composed of baggage car wtih coaches, to transfer the passengers, but on arrival it was seen that the4 train could be brought through intact by waiting a few hours. No. 1, the passenger train that was wrecked is the limited train of this road. It consisted of a mail, express, three sleepers, and two chair cars at the time of the accident. The train was somewhat late out of Waterloo this morning, and two engines were couples on to help make up time. The regular engine, No. 1005, was the lead engine, and was followed by a small engine, No. 916. The passenger train was bout an hour late out of the eastern terminus of this division, and the dispatcher gave them running orders of forty minutes. Engineer O.M. Brown, or as he is more commonly known “Windy Brown,” is known as a fast runner, while engineer Fawcett, the man in charge of the No. 916, is a man who can handle an engine well. Both men are from the freight service, although Engineer Brown is first extra passenger man, and spends over half of hi time in the passenger service. The two men were whipping their long train along in superb style, until the Duncombe station was reached, when a flagman signaled them to go carefully. With a train running close to seventy miles an hours (sic), it is a hard matter to stop wtihin 1000 feet, but the two men shut off the steam, according to report, and Engineer Brown applied the air. The distance was too short and the big engines struck the freight train midways, as it was pulling onto the siding. After applying the air all of the four enginemen jumped, but not successfully. It seems that Walter E. Cutting the fireman on the head engine picked a poor place, for he struck on a log spanning the ditch at the side of the track. His neck was broken, and death must have been instantanous (sic). Engineer Brown was badly cut about the face and body, but is able to move around. Engineer Fawcett on the second engine injured his back in the jump and was somewhat badly hurt. fireman Wood on the second engine struck on his face, which is badly cut. The big 1005 is one of the 1600 class locomotives used on the fast passenger runs. It weighs about 135 tons, and is of the Atlantic type. The big engine rolled over on its side, the side underneath being the left of the side of the cab occupied by the fireman. The entire engine appears to be dismantled, the ponty truck wheels, being found about fifteen feet ahead of the engine body. The big axles, which are about eight inches in diameter were bent and twisted as though they had been small wires. The wheels were torn and dented. The big boiler head is dented and cracked. The cylinders are torn and twisted, while even the driver wheels are dented. The shafts are broken, and warped, while the mechanism seemed to be ripped entirely from the engine. The engine cab is filled with a mass of wreckage, and it would have been instant death for one of the men to have stayed within it. The tender of the engine was also badly damaged, the wheels being torn off. The second engine escaped with scarcly any damage. The front end was crushed in to a certain extent, but the engine steamed into Fort Dodge, without aid. The two big engines acted as a buffer for th epassenger coaches and escaped any damage. The passengers in the sleeper were not even all awakened, while those in the chair cars wre badly shaken out of their seats. the express messenger, baggagemen and mail clerks all received severe jolts, but none wre injured. The big passenger locomotive fell to the south side of the track, while the fregiht equipment was thrown for hundreds of feet along the north side. Four freight cars loaded with oats were totally demolished, while a flat car was ruined. Two of the four freight cars were the first struck were so badly damaged that it would be hard to find a piece of either big enough to use as stove wood. One other car seems to have suffered nearly as bad as the largest piece of it visible is a section of the roofing about ten feet long. the fourth box car is broken in two in the middle, and ruined. The car is to be found about 100 yards up the track, broken in two in the center. In this accident it would have been impossible to tell how many cars were ruined were it not for the car trucks, and even some of these are so badly damaged that it would be hard to tell what purpose they served. The grain is piled along the track for about one hundred feet; and in some places is four or six feet high. Railroad officials on the scene say that the cars will all be burned. Master Mechanic R.W. Bell was one of the officials to accompany the steam wrecking outfit from Waterloo. When seen by a messenger representative he said that he estimated the damage at a little over $2,000. When surprise was expressed at this low sum, he stated that the iron apparatus on the cars, which are always the most expensive can be used over again. the engine while stripped of its fixtures, can be rebuilt for a comparatively low sum. The estimated cost of rebuilding it should not go much over $1,000 according to this official. Mr. Bell expressed great sorrow at the death of Cutting. He said Mr. Cutting was a regular engineer who was working as fireman during the period of slack work. He has always been regarded as a most competent employe (sic) and is a man of excellent habits. He leaves a wife and small child. Mr. Bell said Mr. Brown was also regarded as a very competent engineer and that the crew on the second locomotive were worthy men. He said that the company had been most fortunate in not having serious accidents and that an accident of this kind consequently caused more notice than it would on other roads where accidents were more frequent. There are numerous stories of the cause of the accident and for anyone to sift out which is the correct one is almost impossible, until the official investigation is completed. Superintendent Jones was in Omaha at the time of the accident and did not arrive at the scene until afternoon today. He will return here this afternoon or evening and the investigation will be made. The story that seems to be universally accepted is that the freight train stopped west of the switch, while the brakeman threw the switch for the siding. The train was an exceedingly heavy one, and the air stuck, which caused a delay of several minutes in getting it started. This train was in charge of conductor McNamara and Engineer H.A. Smith of Waterloo. Before the train had gone onto the siding, No. 1’s headlight was seen in the distance, and a flagman hurried down the track to flag this train. Before he could get far enough down the tack, the grain met No. 1. He flagged the train, but the distance was too short and the heavy train could not be stopped quick enough to save an accident. Another story was that the No. 1 had made up more time than the dispatchers order allowed, and when the train arrived at Duncombe, it was ahead of its schedule, and thus caught the men partially unprepared. Thsi latter part seems to be believed by several of the men, but the officials deny it. the Fort Dodge wrecking crew with the smaller derrick were not needed after the big steam derrick from Waterloo arrived. The local men returned here shortly after noon, but the Waterloo outfit will probably remain on the scene until Friday evening at the earliest. The big engine tender was first pulled away from the engine. It was then swung away, and will be taken to Wa- (its schedule, and thus caught the) terloo on flat cars. The big engine will be repaired, somewhat and will then be hauled to Waterloo. The big drive wheels will be able to carry the engine in, if slow time is made. The freight equipment wrecked will all be burned. The contents of the cars will also probably be burned, and the scrap iron will be carried into the shops where it can be used again. Engineer Brown in speaking of the accident said that he saw the flagman about four hundred feet from the switch, and that the train was running about sixty-five miles an hour. he said that he applied the emergency and whistled for brakes. then he jumped to the left and remembered nothing more until he came to an a corn field about fifty or seventy-five feet from the track. His head is somewhat badly cut, while the muscles on his back and neck are sore and bruised. Edwin C. Stark, the engineer on the second train said that they were running about sixty-five miles an hour when he heard Brown whistle for brakes. He reversed his engine and jumped. His left ankle was sprained, his knee was cut and he was injured about the hip and back. His injuries are not serious, but will probably lay him up for several days. Royal G. Wood, the fireman on the second train stated the speed was about sixty to sixty-five miles an hour. He saw Stark jump from his side of the cab and followed him out. His face was badly cut. The men in talking over the affair seem to believe that the whole affair was caused by the flagman being too close to his train, as the limited could not stop within four hundred feet under any possible circumstance when running close to a mile a minute. All were grieved over Cutting’s death, and one said, “I don’t care what happens to me know, I am so glad to be alive.” They say that when they picked Cutting up, his face was in water, which had escaped from the tender. Had he only been stunned he would have been drowned, as he had been there several moments when found. Had any man stayed in the 1005, he would have been killed, as the steam and boiling water was thrown all about the cab and for some distance around it. Coroner McCreight impanelled (sic) a jury and after viewing the remains of Cutting, the jury went to Duncombe. This afternoon was spent in going over the scene of the accident, and viewing the wrecked engine and cars. The jury examined the train and engine before leaving, and will complete its investigations at the Court House this evening. On the Coroner’s jury, besides Dr. McCreight the coroner, were Will Haire, Dr. Lowry and Louis Thorson.